Hot on to arXiv is our latest discovery paper. WASP-157b marks a jump upwards in WASP numbering, since we’ve somewhat rushed this one out. WASP-157 was flagged as a WASP candidate in 2014 and added to our program for radial-velocity (RV) and photometric follow-up. 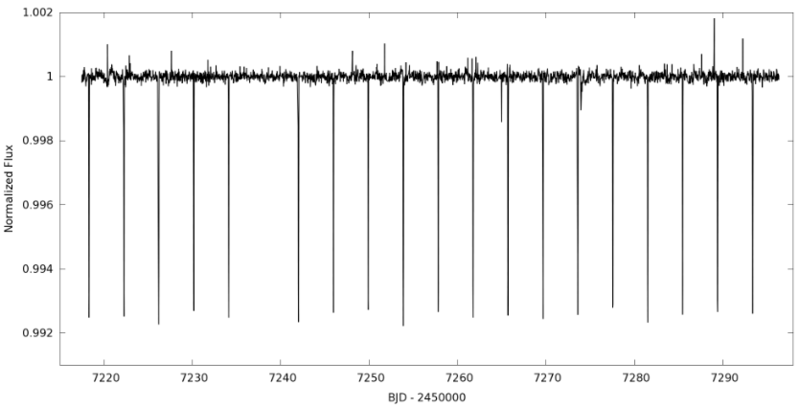 Meanwhile, being in the field of K2 Campaign 6, it was observed by Kepler from July to September 2015. Since K2 data are public, this meant that other groups would soon be on its trail. A TRAPPIST observation of the transit, shortly before the K2 data were due to be released, along with prioritising it for CORALIE and HARPS RVs, rapidly accumulated enough observations to prove it was a planet. Keele student Teo Močnik then did a good job of analysing the K2 data and turning all the observations into a paper. A gap of only four days between the last CORALIE radial-velocity observation and the paper appearing on arXiv is efficient work! This entry was posted in WASP planets and tagged K2, WASP-157b on March 18, 2016 by waspplanets.